Note: My version of this dish is, of course, meatless. (See definition below the recipe.) I decided to call it gumbo because I used okra, a southern veggie not many people like because of its mucilaginous properties, which is what makes it perfect thickener for this dish. Also, see the * at the bottom about using sprouted beans vs canned beans. 1. If using beans that you have sprouted (See info @ end), then you need to cook them in water for about 20 minutes in 2 qt. saucepan. I keep black beans separate because they turn the water dark, so you may choose another bean, such as Great Northern, if you want to cook all the beans together. (Cook these while preparing the rest of the dish. 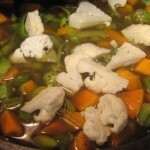 If using canned, add after veggies. A 15 oz. can= approximately one cup beans. (Use cans without BPA, such as Eden beans) If you do use canned beans, drain or use liquid as part of your liquid measure. 2. Saute onion or leek and garlic in oil or ghee. Add curry powder. Then add 1 cup liquid. 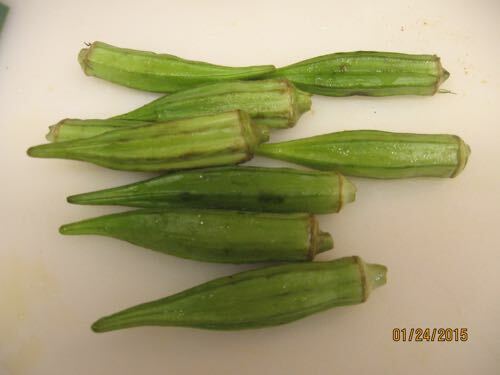 Whole okra. 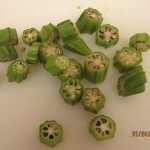 Right hand side is okra cut crosswise. 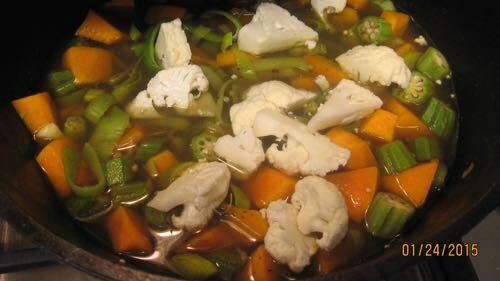 These are the veggies before they thickened with cooking. 4. Depending how thick you want your gumbo, you can add another cup of liquid or not. 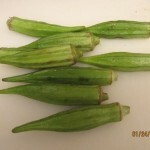 The okra should act as a thickener, depending how much you use. 5. Serve as is, or over rice or pasta. Adding rice or pasta will serve 4-6 people, or one or two very hungry vegetarians! Variations: I added some lentils I had cooked and had no home for. 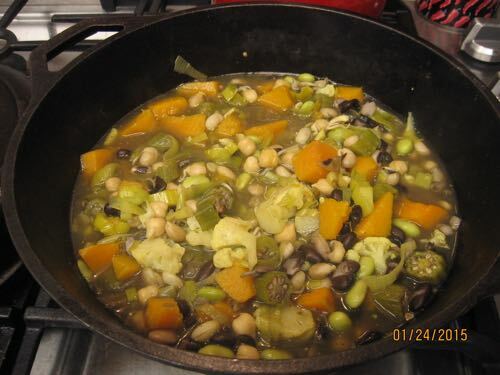 You can also choose other veggies and other beans so each time you make it, the dish is a little different. Good way to use up odds & ends of veggies. For example, you can use squash or potatoes, leeks or onions, etc. *Sprouted Beans*: If you have been following my website for any length time, you will know that sprouted beans and grains are easier to digest, cook quicker, and provide more nutrition than their unsprouted counterparts. Basically, you soak each set of beans in more than enough water to cover and soak overnight. Drain the next day and allow to sprout in a large jar or colander. I like the colander, because the beans are large and need lots of air. After about 2 days of rinsing and draining 2-3 times a day, you will see “tails” on the beans, and you can put them on a cookie sheet to freeze and then place in freezer bags separately until needed, or cook right away. If you do heat them, you can freeze any unused beans to save for another meal. Gumbo is a dish that originated in southern Louisiana from the Louisiana Creole people during the 18th century. It typically consists primarily of a strongly flavored stock, okra, meat or shellfish, a thickener, and seasoning vegetables, which can include celery, bell peppersand onions. 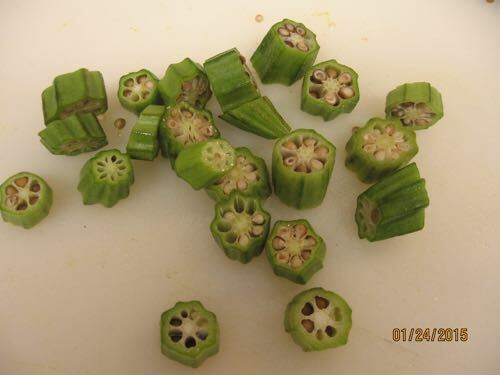 Bonus: Okra is also a low carb, no cholesterol veggie high in Vitamin C and other nutrients. This entry was posted on Saturday, January 31st, 2015 at 7:42 am	and is filed under Kitchen Nutrition. You can follow any responses to this entry through the RSS 2.0 feed. You can skip to the end and leave a response. Pinging is currently not allowed.